Western societies are suffering from a multi-faceted political and economic crisis to which traditional ideologies of the Left and Right no longer offer viable solutions. This book advocates as an alternative 'associative democracy'. Far from being a utopian idea, it offers new forms of economic and social governance as supplements to representative democracy and market economies. 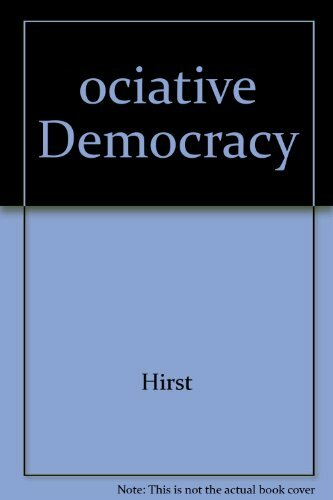 Associative democracy addresses the problems of the overload of big government by democratizing and empowering civil society. It transfers social provision to self-governing voluntary associations, whilst retaining public funding and political accountability. It 'publicises' civil society, placing political responsibility and governmental tasks in the hands of citizens. Accountable government becomes possible because service performance and public control are separated. In the economic sphere it advocates regional economic regulation through public-private partnerships, the promotion of self-governing industrial districts, and the democratization of the firm. 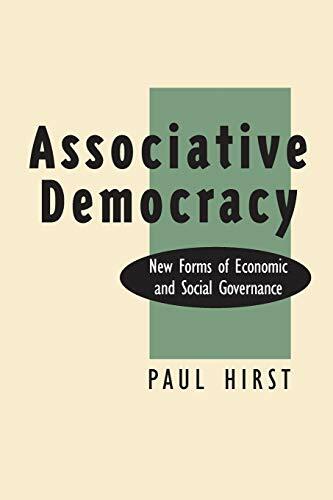 In this way, Hirst argues, public regulation can be made less remote, promoting the growth of relationships based on co-operation and trust and, therefore, ensuring those flows of information and commitment on the part of actors necessary to the pursuit of "quality" in market economies. This book is highly distinctive in the way it combines political theory with social analysis and political advocacy. It forms an outstanding contribution to contemporary political discussion.